William Heddle Nash was born in 1894, not far from London. Following active service in World War One, he attended the Blackheath Conservatoire, and then joined a small English opera company that folded almost immediately after coming to the United States. At this point, what probably was the most important phase in Nash's vocal training occurred: he went to Milan and studied for two years with a retired tenor named Giuseppe Borgatti. Borgatti proved to be a very effective coach; upon Nash's return to England in 1925, he quickly was engaged by the Old Vic to sing many of the major tenor roles – in English. Engagements with the British National Opera Company, the Royal Opera House, Covent Garden, and Glyndebourne followed. He remained active, largely in England, until the late 1950s, and he died in 1961. Nash made several important recordings of large-scale works, including Così fan tutte, The Dream of Gerontius, Messiah, Faust, and Act IV of La Bohème – the latter three with Sir Thomas Beecham conducting. 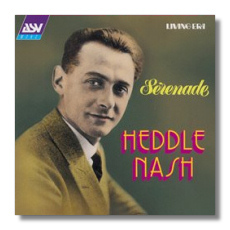 He also made many famous 78s, particularly the Serenade from Bizet's The Fair Maid of Perth, which is the opening track on this AS&V collection. Peter Dempsey, the gentleman who compiled this CD and effected the transcriptions from the 78s, has done a fine job representing Nash's varied career. Opera, operetta, oratorio, and song all are represented, both in English and in the original languages. From the complete Glyndebourne recording (1935), Nash sings "Un aura amorosa" from Così fan tutte, …with touching sweetness. "Sweetness" is an appropriate word to describe Nash's voice. At times some of his highest and lowest notes are a little pinched or forced, yet the overall impression that his voice leaves is one of rare loveliness. Although his timbre is typically English – he will not be mistaken for Gigli or for Thill, for example – it is meltingly beautiful on its own terms. And, although Nash does not find a unique voice for each of his characters, he sings with naturalness, and he projects such a friendly and affectionate persona that I find it difficult to complain. Other tenors may excite, but Nash can be counted upon to soothe, and that's not a bad thing. The transfers are decent, and Dempsey's annotations are very informative. Matrix numbers and recording dates are provided for each of the recordings. This is a good addition to your collection, if you are a tenor-fancier.